Todays task was installing an antennae on the roof to try to get some TV channels. 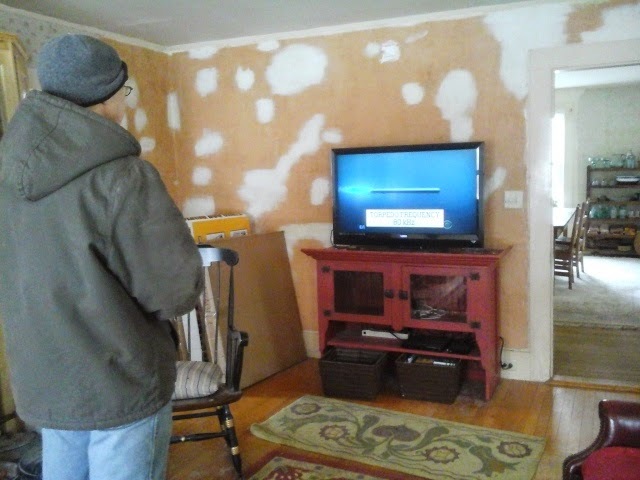 There is no cable here. 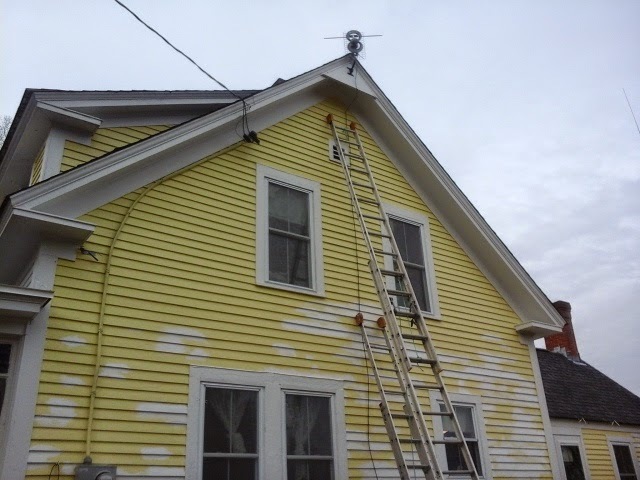 So Steve and our kind neighbor worked together to attach it to the roof at the right angle to pick up some networks. Steve straddled the peak of the roof and Carl, our neighbor stood on the ladder. We are really grateful to have his help, on many occasions. Steve tests out the reception. 23 channels with just the antennae! It will be nice to be able to get some local news and weather. 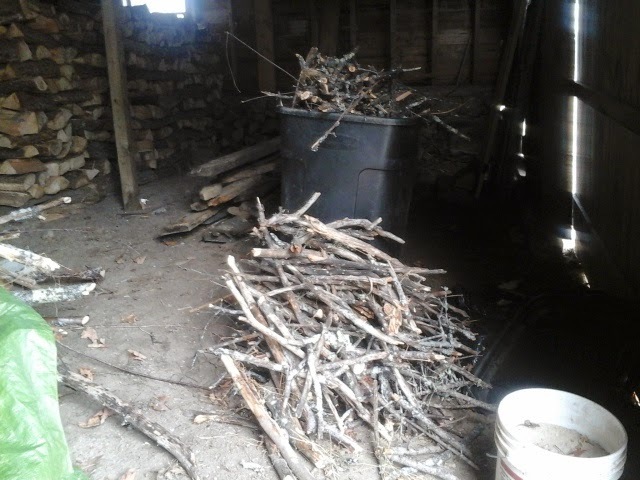 Meanwhile, i took advantage of the calm before the storm to gather more kindling. You cant really have too much of it. Normally we would have been gathering kindling all year, but moving in the middle of the winter put us behind the 8 ball. 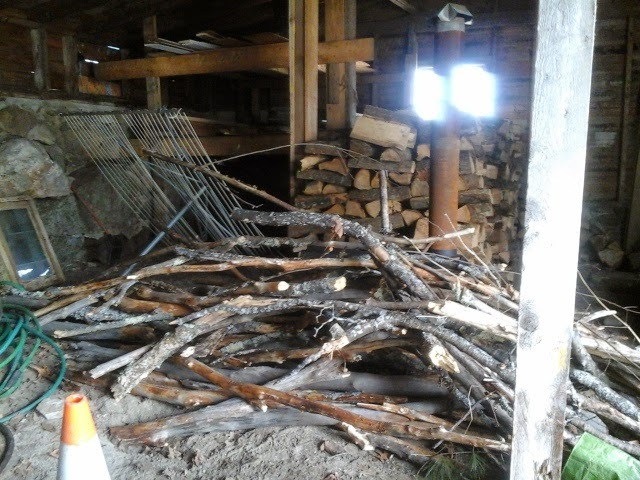 A thaw last week, and several days of rain melted almost all the snow, so this was a chance to get some wood before its all buried again. I barely made it. It is snowing again now. Weather today: 22 this morning, cloudy, and now snowing. Wildlife: two ravens , and the usual birds at the feeder. Daily run: a planned day off from running, but i did numerous hill repeats up a steep hill hauling firewood., plus clearing the branches from the apples trees that were just pruned. Some of them weighed over 100 pounds easily. Thought for the day: Many hands make light work. Thats about a lifetime supply of kindling in Texas. I say we call ur place "The Piebald Estate". Just say the word and all those pesky deer and turkeys will be "removed". ha! yes, the old place is sort of spotted. The plan is to get it painted come spring. I dunno, us Texans can "use" alot of deer! Ur place looks amazing btw!